This is a very strange problem, at first the computer would only reset playing a particular game, post scriptum, now it resets during sekiro, the build is water cooled and all temps are really low. I am getting restarts during gaming and no dump to try and solve the problem. Everything is under 6 months old and I can't recreate the problem with CPU and GPU stress testing. PSU is 1000w and not a cheap one. I'm running 4000mhz ram but have dialled that back to stock and have default clocks on CPU. Is it possible to create a better log to see what fails and causes the restart. IS it just going to be a case of new power supply? Edited by donohue100, 22 March 2019 - 09:57 AM. 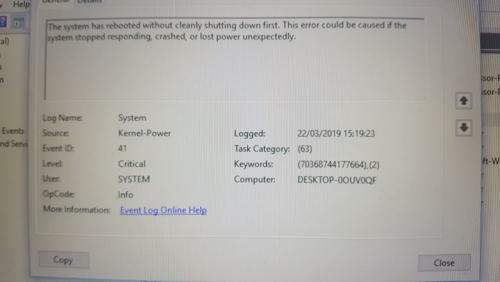 Just wondering, are you getting BSOD's when this happens? That is a very general error code and does not mean that you 100% need a new PSU. Make sure that crash dmps are enabled on the computer "how to" here select the small memory dump option (minidump).